Judge this book by its cover. It has STICKY duct tape on it! 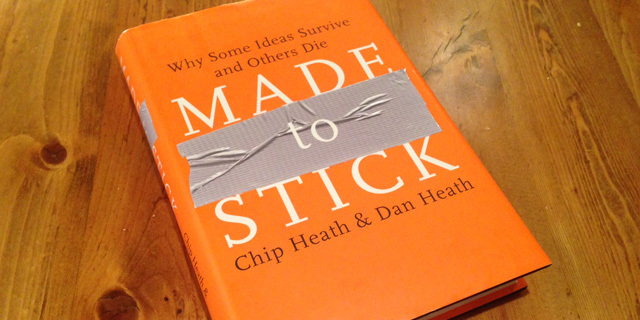 Chip and Dan Heath wrote Made to Stick. The brothers Heath tackle why we remember some ideas while forgetting others. Urban legends are an example of “sticky” ideas. Take the kidney heist legend. It is a story that sticks. There is a beautiful woman who buys a man a drink. He wakes up in a bathtub full of ice with a note saying, “Don’t move! Use the phone beside you.” So he calls 911. The dispatcher responds that there is a rogue gang of organ thieves running the area. “Reach down your back and you will find a tube coming out of it.” He feels the tube coming out of his back! Cue the music: BA DA DUM! But this never happened to anyone. Anywhere. This story is made up. It is an example of a lie traveling around the world before the truth even gets it boots on. It spells SUCCESS! Almost. 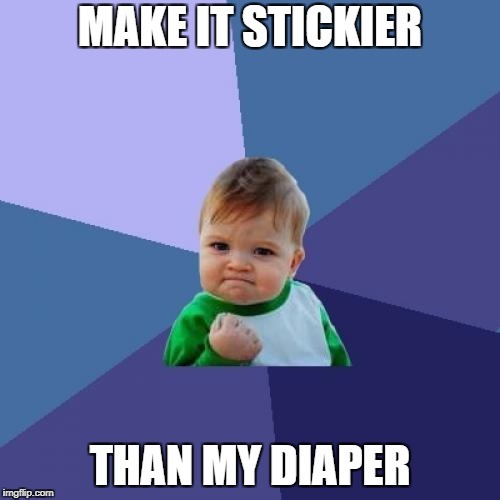 What is the opposite of the sticky idea? It is the Curse of Knowledge. You know so much that you speak like an expert that no one else understands. To make a story compelling, determine the one most important thing. Unravel the core of the idea. And focus on that core idea only. If you say three things, you don’t say anything. Say the one thing. Southwest Airlines’ core is “THE low fare airline.” Imagine that Karen from marketing comes in saying that research shows customers would like a Caesar salad on the flight from Houston to Las Vegas. Does the salad align with Southwest Airlines’ core idea? No. We are THE low fare airline. Go sell salads somewhere else, Karen. We like patterns. That explains why we quickly adapt to the sound of traffic. Surprise makes us want to find an answer. It causes us to pay attention. So in a story, break your audience’s guessing machine and then fix it. Break that pattern with your core idea. What are the unexpected implications of your core message? Unexpected ideas stick because they make us think. Common sense is the enemy of unexpected ideas. The kidney heist legend would be a lot less sticky if the man woke up without his self-esteem. Another example is a small-town newspaper that has the highest readership per capita in the nation. The owner’s core idea is “Names, Names, Names.” He unexpectedly says that he would “print the whole town’s phonebook if he could hire enough typesetters.” This is because his readers want to read their own name or their friend’s name in the paper. And using names keeps his newspaper strong. Someone else may have used the unsticky “focus on local stories” idea. But when the owner tells you that he would print the whole town’s phonebook, then it certainly changes how you write the story. He cares more about names than readability or cost. It’s the unexpected that makes it memorable. 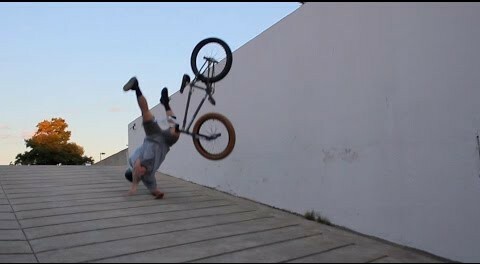 Concrete is easy to remember when you bump into it. Concreteness helps us understand and remember. The concept of “sour grapes” is more than 2,500 years old. There is a similar story in nearly every language. The fox assumes that grapes that are out of his reach must be sour since he can’t get them. It provides a lasting concrete image. Our minds easily absorb sensory information. We can see that fox and smell those grapes. The enemy of concreteness is forgetfulness. The Nature Conservancy is a charity seeking to conserve land. Its research showed that nine percent of California was in serious need of conservation. That nine percent of California is 18 million acres. Imagine 18 million acres! Imagine nine percent! Oh…you can’t? Neither can I. It’s too abstract. So it developed an idea to save landscapes instead of acres. They named an area the “Mount Hamilton Wilderness” that was east of Silicon Valley. Identifying it as a landscape made the idea concrete. And the charity became successful in sustaining the land. They made it concrete. How math is taught around the world provides another example. In Asian countries, it is twice as likely that the teacher will use “computing in context” instead of the rote recall used in the United States. An example of computing in context is that, “you have ten dollars, but then you use three dollars to buy a pen. How much money do you have?” Students learn to perform an abstract concept like subtraction because of a concrete foundation. Memory is not a filing cabinet. It is Velcro. The reason that we remember concrete ideas differently deals with the structure of our memory. This is because our memory is more like Velcro than a filing cabinet. Velcro has thousands of tiny hooks on one side and tiny hoops on the other. Building a sticky story requires you to create hooks for your audience. The difference between an expert and a novice is the ability to think abstractly about a topic. Jurors in a courtroom want to know the facts. At the same time, the judge and the lawyers must argue the case law and the nuances of a jury charge. This is what the authors call the “Curse of Knowledge.” Experts see concrete details as abstract patterns and insights. They want to talk about irreparable harm and collateral estoppel. They forget what it is to be a novice. Credibility helps us agree and believe. Ideas that can be tested are more reliable. If you don’t have an authority to use, try an antiauthority. In the book, those examples are smokers who lost their vocal cords for use in antismoking advertisements. Or a former homeless person who has found a new life because of a social program. Life experience gave them authority. This is why we are more likely to believe a friend who raves about his new razor instead of the advertisement on TV. Because, of course, Gillette wants to sell you four razors for $200. Details increase credibility. Researchers used a mock trial to determine the effect of detail. The juries would decide whether a son would remain in his mother’s home. 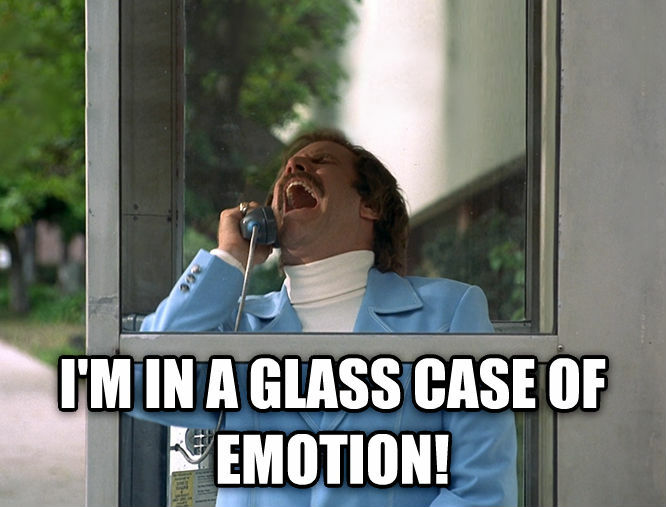 There were two juries. One jury heard she was a good mother and that “Ms. 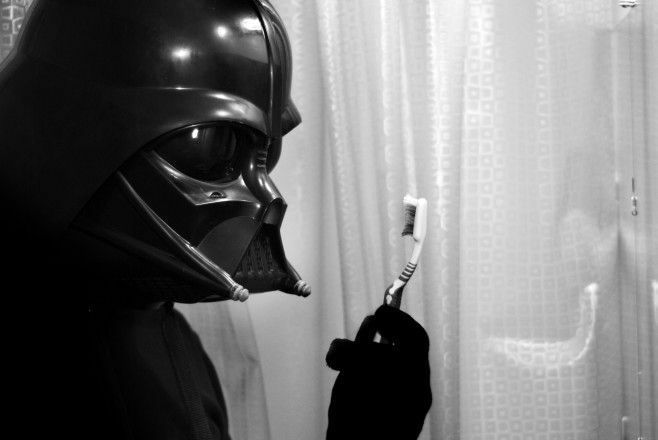 Sloan makes sure that her son brushes his teeth before bedtime.” In the next trial, the jury hears that she was a bad mother but that she ensures her son brushes his teeth and that “he uses a Star Wars toothbrush that looks like Darth Vader.” The jury hearing the details about the Star Wars toothbrush was more likely to find that she was a fit mother, despite the arguments against it. The difference was the level of detail. This detail boosted the credibility of the argument. If I can see the toothbrush, it reinforces the idea that Ms. Sloan is a good mother. A charity wanted to stop the increase of nuclear weapons. So they made the numbers of bombs accessible. They used a concrete idea with a steel bucket and BBs. A person would drop a BB in the bucket, “This is the Hiroshima bomb.” Clang. “This is the firepower of one submarine.” Ten BBs drop, clanging for seconds. He asks the audience to close their eyes. “This is the world’s arsenal of nuclear weapons.” He drops 5,000 BBs. It seemed to last forever. Those numbers are concrete. You can hear them. Be mindful that numbers can mislead. Use statistics for your own input, not output. When we have an idea that we want to prove by statistics, it is dangerous. There is temptation to find numbers that confirm our bias. We should instead listen to the statistics to inform ourselves and then use them in concrete ways to show our core idea. The NBA’s rookie program shows credibility. The NBA locks rookies away in a top-secret hotel for six days. It teaches about life in the big leagues. Part of that new life is AIDS and HIV. The NBA could use Magic Johnson as an authority in that role. They could use vivid details. They could use statistics. But they don’t. It is all too abstract. On the first night at the orientation, the rookies are at the hotel bar. Women are dressed to impress. The women meet the rookies and make plans to meet up later on in the orientation. The next morning, the players wake up alone and go to the conference room for instruction. Those same women from the bar last night are now on the first row of the conference room. They get a new introduction this morning, “Hi. I’m Lauren and I have AIDS.” “Hello. I’m Emma. I’m HIV positive.” Suddenly the discussion turns to AIDS/HIV. The rookies see how a single night could cause a lifetime of regret. Credibility is off the charts. It could have been me. Emotions get us to care. Wire an idea around feelings so it will last. Mass and numbers don’t drive emotion. If you hear there are millions of starving children, it is not as impactful as looking at Amanda, a starving child, and hearing her personal story of starvation. When using emotion, don’t talk numbers. If you look at many, you are overwhelmed. But if you look at one, you will act. Tailor your emotions for the associations of your audience. Appeal to self-interest and identity. Take the “Don’t Mess with Texas” campaign for littering. The audience was young men who were against authority. That campaign featured famous Texans and a tagline that resonated with the audience. It was widely successful beyond its initial core idea. “Don’t Mess with Texas” hit the emotions of its audience. A hospital consultant created a video where hospital staff could see through the eyes of the patient. It shocked the staff because they never realized how confusing and frustrating a hospital experience was for a patient. They suffered from the curse of knowledge. They forgot what it was like to be a novice. Stories help the audience act on your simple idea. This is because stories are a theater for your mind. They are better than arguments because arguments naturally cause the listener to judge your argument and resist your strategy. Stories build consensus. There are three major plots that we use in story-telling: (1) challenge; (2) connection; and (3) creativity. It’s important to acknowledge that you should not exaggerate or make stuff up. Keep your integrity. You just need to realize when life is giving you a gift of a great story. Challenge plots inspire us to act through an underdog theme. David and Goliath is the most famous challenge plot. But there are others not involving famous people. Take Rose Blumkin. She came from Russia not knowing a word of English in 1937. At age 23, she started a furniture store with $500. Blumkin’s stores produced $100 million in revenue 50 years later. She still worked on the floor when she was 100. In fact, she postponed her 100th birthday party to close a store that night. These stories are great for the start of something—the founding of a company, a new school year, the start of a season. Connection plots inspire us in social ways. The best example of the connection plot is the story of the good Samaritan. It is bridging a gap across lines in our society—racial, class, or religious. They make us want to help others, love others, and work with others. There is an old Coke advertisement with Mean Joe Green. The camera is on this large black man. And in walks a little white kid. They share a Coke. It brings them together. This is the MacGyver plot! Creativity plots make us want to discover, be creative, think differently. The best example is the apple falling on Newton’s head for the discovery of gravity. In advertising, it is the story of Jared and his massive weight loss featured in Subway commercials. The audience gets a vote in your stories. This is why we misquote movies. “Luke, I am your father” is not from the Star Wars movie. Also, “elementary, my dear Watson” is never said by Sherlock Holmes. We remember the core idea. We make it simple in our minds automatically. That’s what sticks. Make it sticky from the start. 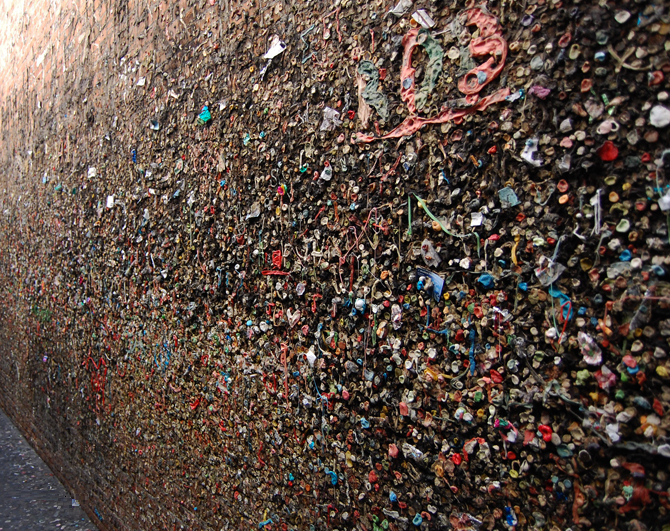 Your ideas will be stickier than bubble gum alley. I will read this book again. It is awash in ideas about connecting with people. And it applies to everyone. Made to Stick gets five out of five hammers. There are a lot of truths in this book. It is a great study.